Tanya Printed at Highest Point A Chabad emissary took Judaism to new heights recently when he climbed Mount Everest to print a copy of the Chabad book of mysticism, "The Tanya," on the world's highest mountain. Meir Elfassy, 30, who works as a "wandering emissary," set out on a two-week adventure with two Sherpas, 10 cans of tuna, matzot, a package of paper and a printer. "The Lubavitcher Rebbe instructed us to print 'The Tanya' in every place where there are Jews, even if it's only one Jew," Elfassy said. He has already printed a copy of the sacred book in Antarctica, but said he had "a dream that I couldn't shake off to print 'The Tanya' on Mount Everest." "It was so the Jews would see me and know that I am Jewish," he said. "One of the Israelis [traveling there] told me that it was nice to see a yarmulke on the mountain." Elfassy managed to survive the harsh weather conditions with minimal food. "You walk 18 hours a day," he said. 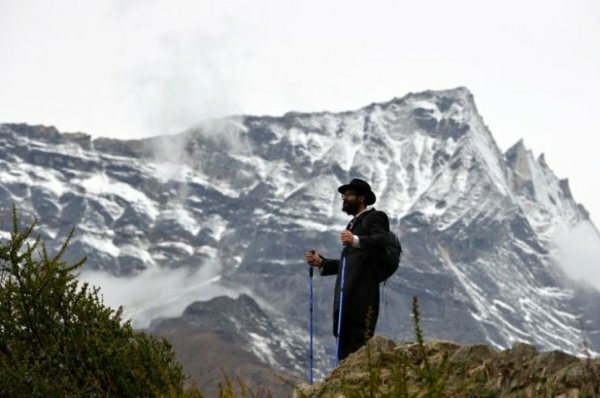 "I lost 10 kilograms [22 pounds] during the trek, so now I need to switch out my entire wardrobe." His efforts paid off when he reached the upper Everest Base Camp, where he achieved his goal. "We went to the base there and asked them for electricity so we could print 'The Tanya,'" he said. "They agreed and helped us print the book for the first time ever on the highest mountain on earth."